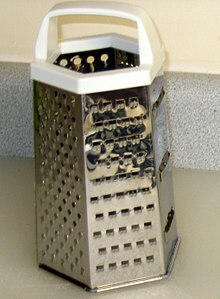 A grater is a kitchen utensil that is usually made from metal (and sometimes ceramic or even wood), with sharp perforations or protrusions used to shred food. Graters come in various sizes: from those with larger perforations which are often used to shred cheese and vegetables, to the very fine graters and micro planes that can be used to zest citrus fruit. Micro planes are preferred by many for their efficiency in producing finely grated food. Fresh ginger or wasabi graters are usually made from porcelain or bamboo, and use spikes or ridges to tear those fibrous rhizomes (they are not clogged with fibres like conventional graters). This page was last edited on 27 September 2018, at 00:48.